Santorini is a unique island. 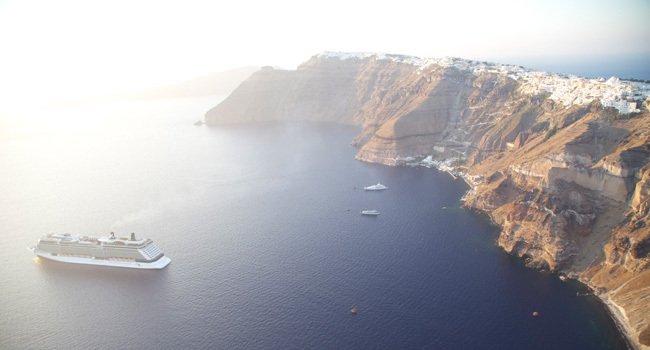 The caldera, the view, the atmosphere, the rich history and the unique products are the main characteristics of an island that offers unique thrills. The eruption 3,500 years ago has created a landscape that you cannot find anywhere else in the entire world. Today the sunset is considered as one of the most beautiful in the world. Stand on the edge and gaze at the wonderful landscape consisted by the volcanoes, the sea and a clear blue sky to experience an unsurpassed experience. On Santorini you can do a variety of activities. Visit the archaeological site of Akrotiri and the museums at Fira. Climb to Ancient Thira to enjoy the view on the whole island and the sea while walking among the ruins of the city that was built here by the Spartans. Swim at beaches with unusual colors such as the Red Beach and the beaches with black sand or pebbles of Perissa, Perivolos and Kamari. Visit Vlihada, a beach with volcanic scenery, while beaches near Oia are Baxedes, Katharos and Kouloumpos. Enjoy the unique local products, such as tomatoes, white eggplant, capers and of course the "strong" wines, full of character that gives the volcanic soil of Santorini. A tour at the wineries of the island is a truly memorable experience. Do not miss the opportunity for a boat trip in the heart of the caldera with traditional boat or a catamaran. The feeling of being at the heart of the evocative caldera is unique. For any information the people of Enalion Suites are available to help, advise you and take care of every detail for excursions and tours on the island.